Recently I attended a bridal shower in which the theme was kitchen gadgets. I bought my gadget, a pizza cutter, and was attempting to wrap it in a somewhat cutesy fashion. I put it in a little gift bag, but it rattled around in the bag and I was afraid it was going to rip open several large and unsightly holes, rendering the act of gift-wrapping moot. So I grabbed some tissue paper to pad around the pizza cutter, and then in the act of getting distracted from the task at hand, I lost the tissue paper. I could not find where I had put it no matter how carefully I looked. Uttering several loud GRRRRRRRRRs, I cast about for something else to pad the gift with and I hit upon some dishcloths I had knitted in years' past and stuck two of them in the bag to cushion the pizza cutter. Knitted dishcloths=double duty: padding and washing! Why? 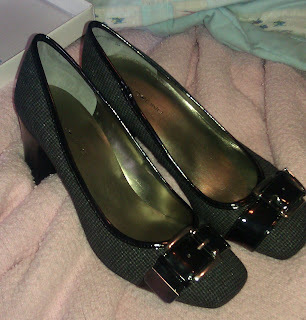 Because I haven't posted about shoes in a long time. Hayley has very particular taste in a lot of things, and I found out yesterday that one of those particular things is shoes. Not that I mind her having a very particular taste, and particularly in shoes, but it does make for somewhat of a frustrating shopping trip when her particular tastes don't mesh with mine. (Spoiler alert: it turns out fine in the end). There were lots of knitted brows and sighs and curled lips and grrrrrrrs. Scout camp looks fun. Jim took a few pictures during his short stay at Many Point with Matt, and I wish YW camp when I was a teenager was more like scout camp. In fact, I wish YW camp NOW was more like scout camp. Granted, I might not want to sleep out in a shelter I made myself unless I was able to make it spider-proof, but I would love to have had to MAKE a shelter at camp. Sticks and I got along pretty well when I was a kid. My mom always said kids don't need toys, all they need are sticks and dirt and they'll have plenty of fun. I suppose I didn't need scout camp to tool around on a lake in a small paddle-powered watercraft. Julie, Jenni and I went out in mom's canoe on Lake Minnewashta plenty of times so I do feel I fulfilled the "spend time paddling around a body of water" aspect of scouting. There are more adventures to hear about when Matt gets home on Saturday. I don't really have anything to post about, but I feel like sitting at my computer and tapping on keys for a few minutes. Hayley and I are the only ones home for a few days. 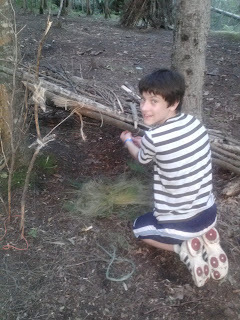 Jim took Matt up to scout camp and will be there into next week. So it's just me and my little girl. Hayley and I went to Mom's to mow her lawn. I came home with peaches. (Dave, if you ever read this blog, know that I have your half box of peaches. You have a week to claim them.) It used to be strange to go Mom's for a visit with my little kids in tow, and Mom without her children. Now I find myself over at her house with very few of my own children. I'm moving toward that phase of life that I thought was strange to see my mother in: the empty nest.